Connect, configure and manage a remote RS-232 serial device, over an IP network. The NETRS232 Serial Device Server lets you remotely access and manage an RS232 serial device over a local or wide area network (LAN/WAN), giving you a simple and cost-effective serial-over-IP control solution. For installation flexibility across a variety of locations or environments, you can power the serial device server using either a 12V DC power adapter (included) or through the integrated 10~30V DC terminal block. Plus, the device server is DIN rail mountable for out-of-the-way installations. To help ensure seamless performance and prevent possible damage to the server and connected devices, the serial device server offers 15KV ESD (Electrostatic Discharge) protection. This highly-customizable device server is easy to configure to suit your application, with versatile browser-based or Virtual Com port software configuration and integrates support for VCOM, TCP Server/Client, UDP, HTTP, DHCP, ICMP(PING), Static IP, and ARP protocols, while supporting baud rates up to 230.4 Kbps and is compliant with IEEE 802.3, IEEE 802.3u standards. 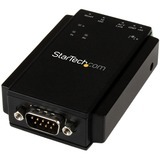 Backed by a 2-year StarTech.com warranty and free lifetime technical support.